Day 5 of SIRR presented an opportunity for SRC to pick up a plethora of medals in medium boats, being Fours and Doubles, as well as a chance for our Para athletes to shine. By the early afternoon, SRC was ranked third in the medal tally, a promising position ahead of our big boats and Club events over the weekend. The morning kicked off with Ella Hudson and Sophia Carmody taking out a Silver in the Women’s Under 19 Double Scull. 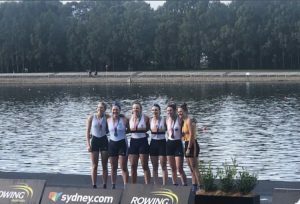 The crew has had limited opportunities to train together, with Sophia still rowing with Pymble Ladies College, meaning this was a particularly strong result. In the U21 running of this race, Lauren Lyon rowed with Crystal Piper – who came in as a last minute medical substitution for Issy Jonsson – to take a silver medal. A great result for a scratch crew. A short time later, after being narrowly edged out by Mosman in the heat, our U21 Men’s Coxed Four of Ash Nicholls, Torun Olson, Oscar Carr-Middleton, and Oscar Olsen – coxed by Harry Keenan – brought home our first National Championship of the day. 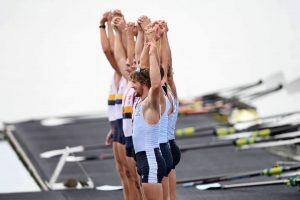 Harry commented that it was one of the most enjoyable races he had ever coxed. The crew laid down a solid rhythm and led start to finish. Inspired by her younger sister, Harriet Hudson joined forces with WARC’s Georgia Patten to take out the U23 W2x. In a start to finish lead, this was a commanding performance, and will be a combination to watch in the coming selection trials. Moving onto the Coxless Fours, Sydney was represented in both the Women’s and Men’s renditions. In the Women’s event, Lauren Graham and Issy Furrer teamed up with Western Australians Lia Franklin and Olivia Jones to stick it to the favourites, SUBC/UTS. The crew threw the kitchen sink at it, however had to settle for Silver in a tight race. Immediately following, our Men’s crew of Alex Nichol, Harry Crouch, Jackson Kench, and Alex Potter, came up against an incredibly strong field. With the minor positions changing all throughout the race, the boys held off Mercantile by just 0.20 of a second to take the Bronze Medal. In the last few finals of the day, our Para Athletes Ben Gibson and Erik Horrie had their time to shine. Ben had an incredibly tight race in the PR3 M2- with partner James Talbot. 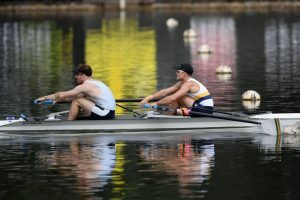 The duo fought with rivals from SA for the first 1500m of the race, before pulling away in the closing stages to secure a national championship. Five-time World Champion Erik Horrie, had the rare opportunity to have international competition on his home course. Facing off against Hong Kong’s Ajmal Victor Samuel, Erik put down an incredibly consistent race to secure another National Championship. SRC is set to boat 11 crews A Finals tomorrow morning, in what should be a fantastic morning of Quads and Eights racing. 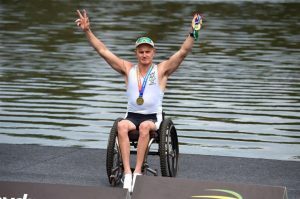 Thankyou to Rowing Australia/Delly Carr for the photos.